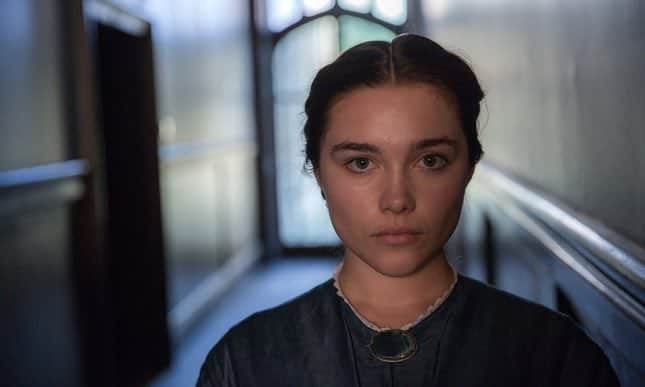 Fans of the Shakespeare might be a little surprised to find out that William Oldroyd’s brilliant debut feature Lady Macbeth isn’t exactly an adaptation of one of the Bard’s most loved tragedies. Set in rural England, this Victorian chamber piece is every bit as dark and twisted as any shakespearian tragedy worth its salt. Not only does Oldroyd manage to immerse his audience in this suffocatingly patriarchal world, but he also offers a very modern stance on one woman’s destructive quest for lust and passion. Adapted by Alice Birch from a 1865 novel by Russian novelist Nikolai Leskov, Lady Macbeth tells the story of one woman’s defiance and rebellion against the cruel men in her life. Florence Pugh is electrifying as Katherine, a young bride sent to live in a farm owned by her new husband Alexander (Paul Hilton) and his family somewhere in the north of England. Almost immediately after her arrival Katherine realises that Alexander has no interest in her and would rather never have to see her or even fulfil his marital duties with her. As feelings of boredom and loneliness start to take their toll, Katherine grows tired of being treated so poorly by her disinterested husband and his meddling father (Christopher Fairbank). After both men are called out on separate business matters, the young bride seizes the chance to rebel against her new family’s rigid rules. Soon she embarks on a torrid and destructive love affair with handsome farm-hand Sebastian (Cosmo Jarvis). In a way, you could say that Lady Macbeth has all the makings of a politically charged feminist movie, with its fearlessly upfront female lead and its unapologetic twists and turns, the film offers its female protagonist the chance to take back what she believes is rightfully hers, her destiny. Having said that, it is vital to point out that this cautionary tale is far more nuanced than all of that. Having been freed from her corset, literally as well as metaphorically, the young woman loses all the inhibitions tied to centuries of good breeding and proper behaviour. Oldroyd manages to cleverly keep his audience on the side of his heroine, even when they find themselves questioning her actions. Lady Macbeth not only manages to put a new spin on an old story, but it also succeeds in cleverly injecting some new ideas to it. Despite the obvious shortcomings of the small budget, Oldroys and his cast manage to dazzle as well as enchant. Pugh is on the way to great things if she continues to be cast in these kinds of roles. It is also worth mentioning the fantastic performance by newcomer Naomi Ackie as Katherine’s doting maid Anna who is alone in knowing what the young woman is capable of. Ultimately, Lady Macbeth offers a thrilling story which will shock as well as thrill. Lady Macbeth is on general release from Friday 28th April.